As conservatives survey the disastrous spending bill that Congress is apparently about to pass two bits of old time Washington political wisdom come to mind: The first is that you can always tell who has the power by who gets the money, and the second is that forget campaign promises, the only commitment that counts is money. Judged by those standards, the Continuing Resolution (CR) to fund the government for the rest of the Fiscal Year makes two things equally clear: The first is that despite Donald Trump’s historic election win it is Speaker Paul Ryan who is really running the show in Washington, and the second it that President Ryan has no intention of fulfilling candidate Donald Trump’s campaign promises. As our friend Daniel Horowitz of Conservative Review observed in a great analysis of the draft CR now circulating on Capitol Hill, once Republicans telegraphed the message that they’d jettison every conservative priority from the budget, Democrats then held out for their priorities. By and large, they got them. Even worse, although $1.5 billion in additional “border security” funds were allocated, Democrats made certain to bar funding for the fence. The bill continues funding refugee resettlement and visas from the six countries from which Trump wanted to suspend immediate immigration, despite this budget being the last recourse against the judicial tyranny that stymied Donald Trump’s Executive Orders on immigration. The refugee program gets $3.1 billion, the same as it did under Obama. Sanctuary cities were funded, despite the judicial tyranny that stymied Donald Trump’s Executive Order on illegal sanctuary cities and the need for Congress to weigh in. Planned Parenthood was funded, despite the long-standing GOP promise to fight to defund it, even when they only controlled Congress. Yes, they couldn’t even defund a private organization getting taxpayer funds to traffic baby organs observed Horowitz. Increased spending for a number of liberal priorities rather than codifying Trump’s requested $17 billion in non-defense spending cuts. EPA was saved from the cuts proposed for this year by Trump’s OMB. A $295.9 billion bailout for Puerto Rico’s irresponsible Medicaid program. This is on top of the bailout from last year. Sec. 543 of the omnibus contains a provision opening the door for more H2-B low-skilled workers this fiscal year. $990 million increase of the “Food for Peace” program in Africa. Government-run health care? HHS will see a $2.8 billion boost in spending, of which $2 billion will go to the NIH, which was supposed to be cut by the Trump budget. Green energy programs within the Department of Energy, programs Trump would have eliminated, received a modest spending increase. The federal judiciary saw its budget increased by three percent, to $7.4 billion, from fiscal 2016, despite engaging in civil disobedience against the rule of law. The unconstitutional Consumer Financial Protection Bureau is fully funded despite GOP promises to dismantle it. Richard Cordray is still serving as its director despite the change in administration. California’s high-speed rail will continue to be funded by the Federal Rail Administration and despite California being the epicenter of the resist Trump movement. 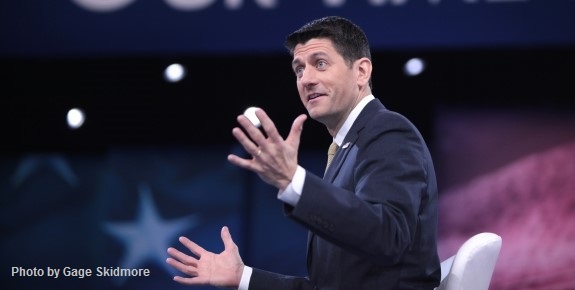 President Ryan’s spending bill so closely matches Barack Obama’s priorities that it is doubtful Far-Left Democrats in Congress would have done better if Hillary Clinton had won the election and Republicans had retained control on Capitol Hill. But this is the way it always goes with President Ryan. Ryan’s budget brinkmanship strategy is to wait until the government is about to run out of spending authority, then demand that conservatives cave-in on the Democrats’ priorities. Last week in our column “Conservatives Want A No Excuses Budget From The GOP Congress” we said as President Trump’s 100-day mark approaches for once the judgements of the establishment media and his supporters will be in alignment – without funding for the Border Wall and his other priorities, and with the continued funding of the many Obama – Clinton policies he campaigned against – the President’s first 100 days will be judged a failure. We urge our conservative friends and readers to call their Representatives and Senators (the Capitol switchboard is 1-866-220-0044) to demand funding of the border wall in the soon-to-be-passed continuing resolution. Tell them no excuses; we elected President Donald Trump, not President Paul Ryan. Submitted by email_registrat... on Wed, 05/03/2017 - 16:23. Unfortunately I reside in Illinois; all my representatives are democrat. They will do nothing to help rebublicans. This guy is just a two faced rat. He's been carrying water for Obozo and now is trying to create a power struggle with Trump. He will lose! Trump has to fire all of the Obama hold-overs for a start. Then needs to put a collar on Ryan or dump him. Enough is enough. We don't need a gutless wonder as the Speaker of the House. You can't serve two masters. Grow some balls and be someone. Start acting like a constitutional conservative instead of some Democrap cupcake. He is no better than his predecessor, who was bought and paid for! Trump has his work cutout for himself. The swamp rats are firmly dug in. And a fair amount of them are RINOS! When will voters realize that our bottom feeding politicians only work approx. 180 days, and get paid handsomely with full benefits plus full expenses while being treated like royalty. Term limits are the answer. Till then... same old crap! God help us. Submitted by email_registrat... on Thu, 05/04/2017 - 13:01. Excellent comment above - bravo! Who has the REAL majority in Congress? Submitted by Charles Martel on Tue, 05/02/2017 - 13:04. Congress may have a slim majority of "Republicans," but it's obvious that, between the Bolsheviks (like Nancy Pelosi) and the Mensheviks (like Paul Ryan), the socialists have a strong majority over freedom-loving Americans. As Richard Viguerie has often stated, the real opposition to conservatives is not the "Democrats" (i.e., Bolsheviks), but the RINOs (i.e., Mensheviks). These latest shenanigans prove it. Submitted by email_registrat... on Tue, 05/02/2017 - 12:58. It appears these legislators have been either bribed, extorted or indebted to the criminal cabal of the Establishment who have zero care or regard for 90% of the Americans citizens. They only care for themselves and those in their cabal. Submitted by email_registrat... on Tue, 05/02/2017 - 11:38. It has been obvious to me for years that RINO's need to go- topping the list is Paul Ryan. This is the man that has screwed the Obamacare pooch for years. Now, despite the fact that Pres. Trump won Ryan's home state, he continues to carry water for the Democraps (obviously, he wants to stay on the money-train that is Washington politics). If the Repubs in Congress keep acting this way, they had better plan to be replaced in 2018. Tea Party, gear up and run your own candidates against these RINO's! President Trump- it would be wonderful if you would work to end the un-earned retirement package that Congress has awarded itself before we remove this trash from public office. Submitted by email_registrat... on Tue, 05/02/2017 - 11:09. Enough of this play along to get along. President Trump was elected to right the ship and not play 2nd fiddle to a bunch of turncoats that are in it for their own gain.